Evan, Carrie and I were recently fêted at a rooftop soiree honoring Nashville's Prettiest People. We were voted the top three Prettiest People in all of Nashville. * Here are some of the outtakes from our upcoming magazine spread: *Clearly we are pretty but that's not what this photoshoot is from. Just your run-of-the-mill rooftop party with a professional photographer. Over the weekend, I poised a question on Facebook: do Ped Eggs really work? "My best friend has one and says it works!" "My mom has one and she loves it." "I have one too and I like it. Just don't use it when you get out of the shower." "Eh, I am not a huge fan...maybe I am doing it wrong??" Five out of six was good enough for me, so yesterday when I went to Kroger, I swung through the beauty aisle to pick up a Ped Egg of my very own. t $9.99, it was still cheaper than a pedicure and I only hoped the Ped Egg would last longer. As soon as I got the food put away, I plopped on my couch, assembled my Ped Egg and went to work on my dry, cracked heels. I noticed how dry my feet were when I came back from Vegas. I don't know if it the over-chlorinated pool, or walking around on a pool deck so much, or just all the walking in general, but my heels have never been so dry and cracked. Lovely image, I know. So I was expecting the Ped Egg to take down that dry skin like a weedeater. Shave shave shave. Back and forth I went, occasionally peering at my progress. Was I making any headway? I shook the egg hoping to hear some shavings held hostage inside. Nothing. I kept at it for a while and after not noticing too big of a difference on my heels, I finally decided to open the Ped Egg to see what damage I'd done. I was expecting to find something resembling sea-salt, but instead I found a tiny pile of what looked like pepper or ashes. But at least it was something, so I put it back together and kept going. I applied more pressure and continued Ped Egging for another 20 minutes. The skin/pepper pile had definitely grown by the time I was finished, but I am not sure I got my $9.99 worth. My heels were definitely not as smooth as I thought they would be. Maybe it sounds dumb but I definitely noticed more of a difference when I applied more pressure. I guess I was scared of taking off too much at first. Is there a way to do a Ped Egg wrong? What's your Ped Egg secret? So when left off, C and I had seen some more sights and enjoyed time by the pool on Saturday, our second full day in Vegas. 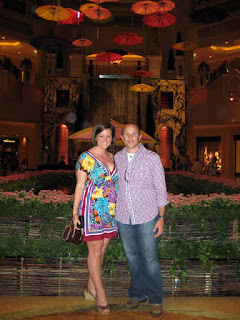 We freshened up and headed to the monorail, so we could go check out the Wynn and Encore. Those hotels are so hard to get to - C knew there was a shuttle running from the monorail stop to the hotels, but they stopped doing that in February. Not wanting to follow instructions and (I quote) "Get on the southbound shuttle, go to the next stop and walk from there") we figured we'd just walk from where we were. No need to ride the monorail again, right? Wrong. We hoofed it through some back roads and sketchy apartments until we got to the Wynn and the Encore. We had to step through some bushes to cross the street. It was like we were sneaking up on the hotel! But how much was that walk worth it - what a gorgeous place! Both hotels were elegant, charming, fun and regal all at the same time. The interiors were so pretty. I was that girl, taking photos of the floral arrangements just because they were so breath-taking. We passed the Wynn Theater and the Encore Theater, home to Circque de Soliel's La Reve, the late Danny Gans and future home to Beyonce for four nights in July. Eventually we had gawked enough and made our way to dinner. Chris chose a quaint little spot in the Wynn called the Terrace Pointe Café. I was delighted with his selection. Cute, cute, cute. We enjoyed our meal and dessert very much, and even though it was dark outside, we could still see the lush landscaping of the pool area that the restaurant was overlooking. After dinner, we enjoyed touring the hotels a little more. I thought he was just super-impressed with the decorations, but turns out when Chris's jaw hit the floor he was not so much caught up in the flora or fauna but in Miss Ricki Lake, who had just waltzed past us looking svelt as ever. 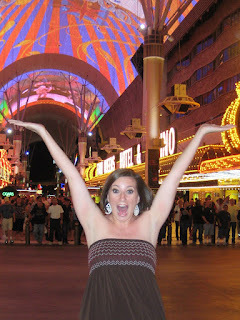 We hopped in a cab and headed off to Fremont Street. I think they should have left Fremont Street alone. I understand the point of enclosing it to make it more pedestrian, but I think the lights and all were probably just fine the way they were - no need to add a ceiling. We walked the block, took some photos and decided we'd seen enough. We rode the people mover at Bally's on our way to see the Bellagio Fountains for the first itme in their entireity. Holy cow. The song was from the suite from the ballet Gayaneh and is called "Dawn, Ayeshe’s Dance." I was glad we got to see classical music as that is how I had always envisioned the Fountains (thanks, Ocean's Eleven). Knowing we'd be back at the Bellagio the next night, we moved on and decided to go try our hand in the casino at the Monte Carlo. I played some slots and then Chris and I picked a Roulette table to play at for a while. He blamed our bad luck on my selection of hot pink roulette chips, but whatever. Come on, machine, work with me! And now, Sunday. My birthday. We slept in and then meandered out way to the MGM Grand Brunch. There was a lot of people and a lot of food. I happily gobbled up my birthday brunch and then we decided to spend the majority of the day at the pool. We joined the dancing people playing in the wave pool before parking it in the wading pool. After a long stint in the sun, I went upstairs and got into my party dress for the night. First stop: Bellagio, to pick up our tickets to see O. I felt like a little girl playing dress up in my shiny new dress and silver heels, strolling through the Bellagio with C. It was all just too good to be true. We got our tickets for the show, and decided to grab a drink and appetizer at Fix, an interesting restaurant/lounge around the corner from the theater. Chris had wanted to try Fix, and for good reason - we decided since the menu looked so great and we had time to kill, just to go ahead and eat dinner, and we were not disappointed. It was great food, artfully served. Told you I was feeling fancy! We slid into our seats at O with only a few minutes to spare. O was clever, creative, whimisical and more. There was diving, acting, fire, contortionists, comedy, trapezes - it literally had it all. I am happy to say that O gets the distinct honor of being named my top recommendation of what do to in Vegas. After the show concluded, we utilized my free play money at the casinos, where I won $5 (woohoo!) and saw the fountains again (another classical piece - "Winter Games") before moving on to a club so we could shake our groove things. 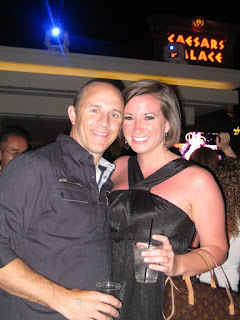 We settled on Pure at Caesars Palace (side note: did you know there is no apostrophe in Caesars because they want all their guests to feel like a Caesar? It's plural, not possessive - interesting, right?). We get to Pure and are happy to see the line is not that short. I reach into my purse to get my license out, when I realize my license is still in my beach bag back in the hotel - a good hike away. Big, fat oops. 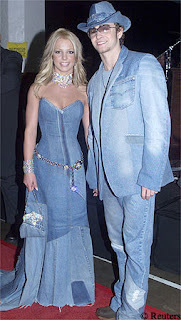 I was SO embarrassed. Of course, Calm McEasygoing hardly batted an eye before marching us back to the cab line. I wanted him to fuss at me so I wouldn't feel so guilty. I mean, of course I didn't MEAN to leave my license, but I didn't want to be so selfish as to insist we go get it and come back. But, on the other hand, I certainly wasn't ready to call it a night. So, rather than make the long walk to go get it, we hopped in a cab, swung by the Monte Carlo and were back at Pure within about 20 minutes. Quite a fail, but at least a fixable one. We walked in and the place was empty. Well-lit and lovely, but empty. Everything was white, silver, cream or ivory. We wondered where all the people were, until we saw an elevator to take us upstairs. Jackpot. The view from the terrace was AMAZING. And on the terrace itself, more white and silver and gorgeousness. We had an absolute blast, dancing and people watching long into the night, until we decided it was time to head back. Our view at Pure - priceless! The next morning we checked out and headed to the airport for our 11 am flight home, which was much less raucous than the flight to Vegas. I was so sad to leave but very happy with my memories. We definitely conquered Vegas and I have no regrets about the trip. It was so perfect, worth the wait and I can't wait to go back! 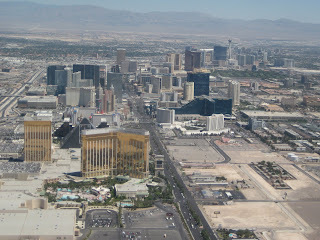 View out my plane window - goodbye, Las Vegas! Before I tell you about the second half of our trip, I have to share about last night's inaugural gathering of my monthly Bunko club. Holy cow, was it fun. The hostess for each month (this month it was Casey) picks a theme and provides food. So last night we had a salad bar and a baked potato bar. After discussing the rules and teaching everyone to play, we were ready to get our game on. Each game has six rounds. I think we will play three games from now on, but last night since we started late, we only played two games. We decided that whomever wins the most rounds in one evening will win the largest share of the pot; whomever rolls the most bunkos wins a smaller share of the pot, and whomever receives the most votes for best costume received the smallest share of the pot (when costumes are applicable to the theme). So in game one, I managed to win five of the six rounds. Woohoo. In game two I only won three. That left me and another girl tied for most wins. The tie-breaker for that is most "out of towns" (a different combonation of dice that you roll). We were tied there with two each. Some people wanted us to have a roll off, but we decided we'd rather split the winnings. So guess who got her $10 back plus an extra $25? Kind of ironic that I went all the way to Vegas and lost money, but won $35 right here in Nashville. The winner of Best Costume was Mary Byrne - look at her, didn't she deserve it? Don't miss the bedazzled pockets on that jumper. I think I would have won it had we not already awarded money to the winners. I definitely had the most creative costume, with my denim skirt doubling as a tube top. Classy, isn't it? I hope I have started a trend. I am looking forward to many more months of this. Especially if I can keep my winning streak alive! This morning, my sister sent me the link to an article on Politco.com about a hilarious incident regarding nicknames. Someone on the Hill offended someone else on the Hill (not to be confused with someone on the Hills, mind you) by shortening her name from Elizabeth to Liz. Big mistake. Turns out Elizabeth HATES being called Liz. Read more about it here and don't miss the second page with the actual transcription of the e-mails. I can't say that if someone was that rude to me after that many apologies, I wouldn't leak it either. Would you? I'm sure Elizabeth/Liz is the one doing the apologizing now. Hope she learned her lesson. 1. Get my name wrong - I started my first job in May 2006. A week later, they hired another young brunette, named Leslie. She worked two doors down from me. We became buddies. We worked on a few projects together. People from that office STILL call me Leslie. It drove me crazy while I was there. She and I conferred and it was easy to tell who really knew our names and just slipped up occasionally and those who didn't know who was Lindsay, who was Leslie, and didn't really care to learn. Fast forward a year. C's sister-in-law's sister, whom I have seen often lately with the birth of little baby G in March, called me Leslie three times on three different occasions before I finally told her my name was Lindsay. To me, this is the worst offense. Am I saying I know the name of everyone I have ever met? No. But I try. And if I don't know their name, I ask someone who does or I don't use a name at all. Close only counts in horseshoes and hand grenades. My CWE kids would always be so impressed because by the end of Day 1, I knew all their names. It was a personal goal of mine (and a lot of other counselors) to get their names correct because it shows respect. Plain and simple. 2. Misspell it - now obviously, if you've never seen it in print then you have no excuse. But when we e-mail back and forth all day long, and the correct spelling is right there in your inbox in black and white, I'm going to think you are lazy when you (repeatedly) spell it wrong. This. Drives. Me. Crazy. Again, it's a respect thing. One time, two years back, a coworkers kept calling me Lindsey in an e-mail exchange. After the third time, I signed my e-mail LindsAy, hoping she'd get the hint. Again she came back with Lindsey. So, I decided if she was going to misspell my name, I would misspell hers. Even though it had three letters, I found an alternative spelling for it and used it in my reply to her. I'm pretty sure it didn't work, but I felt better. The worst when people drop a "z" in my name. I had a client that once spelled my name "Lynz" - WHAT? That sounds like a car. Linz, Lindz, Linzee - no, no, no. I can deal with Linds, Linny, Lulu or a myriad of other nicknames but please, no Z's. Now. Like I said, I am not perfect and I know I have committed both of these fouls before but here's the key - I try REALLY, really hard not to. If I have to Google someone to get their name right, I will; even if it's just to find out if there's a space in a double name or not. It's that important to me. I think it's because I am obsessed with my own name (monograms, etc. ), but there are a lot worse priorities I could have than to get a person's name right. I would feel bad preaching about this if I knew I was the only one who can't stand it when her name is butchered. I know there are LOTS more of you out there. And if you think I am being ridiculous, be sure to tell me. Just make sure you spell my name right when you do! *Mom + 1 came to town yesterday for my birthday. We had a fun day visiting the temporary Judd Museum (don't act like you didn't know I was a Judd fan), shopping, then eating dinner at C's house (he grilled us some delicious steaks and ribs, yum!) and then we all trucked it downtown for the last night of the CMA Fest. It was a great show, too long if anything, and C and I left after the surprise guests (Sugarland)... and that was at 11:30 pm, before Kenny had even taken to the stage. *Mom brought some birthday gifts with her, including some amazing homemade strawberry cucpcakes and a set of big girl luggage, which I have already set out to start packing up for Vegas! What a great gift! Thanks Mom! *Did you know that all ten seasons of Friends are now on iTunes, ready for download? They used to have only three seasons up, but now all ten are there! I have started downloading my favorite episodes one-by-one and putting them on my iPod. C's friends left this morning. Did I mention that the last time all five of them were together was more than a decade ago? I am so happy to have been a part of such a memorable weekend not just for C but for those four guys too. Yesterday involved a lot of hanging around and being lazy on the couches. Eventually, the six of us plus C's brother went and had dinner before heading out. C and I had tickets to Coldplay that we certainly didn't want to skip, but we didn't want to leave the clan either. We all took our time at dinner and he and I got to the concert just before Coldplay went on stage. Wow. What a show. We stayed for most of it and were amazed. Chris Martin wasn't at all how I expected him to be - much more playful and excited. The lights and special effects were so cool. You could tell a LOT of thought went into that show. We left just after the cell phone wave and "I'm a Believer," which was near the end of the concert anyway. We found the boys and headed off to do some much-anticipated karaoke! I may have mentioned before that C is a great singer, but this weekend I found out his friends are, too. We heard "1979," "Moving Out" and "Wanted Dead of Alive," none of which topped a group performance of "Sweet Caroline." Of course I held my own with "Something More" and "Don't Stop Believing." It was a fun, fun night. When I started planning this weekend back in January, I wasn't sure how it would go. But it surpassed every expectation I had, and I know it surpassed C's expectation since he didn't have anything to expect. I know he felt so special, and more than having fun or hosting a great party, that is what I was aiming for. But enough about his birthday! Do you know what's in two weeks exactly? My birthday? Vegas? All of the above? Yes yes yes. Hope you all had a good weekend. If your bass is so loud that it sounds like your car is FARTING, then it is inarguably too loud.